The Eugene, Cascades & Coast Go Campaign launched in April 2016 to help build and reinforce the brand identities of four select "destination" communities within Lane County. A myriad of media platforms are deployed, including social media, digital remarketing and transit billboards. These strategically placed ads target regional and local markets, inspiring both Portland and Eugene - Springfield visitors and residents to delve deeper into the adventure-rich outlying communities. Consumers visit our GO page to select an adventure and link to more details on those activities and communities. Additional components included transit wraps, digital ad designs and Pandora. We set a goal to draw Portlanders down I-5 and Hwy 101 for destination stays as well as reach visitors to Portland through visible placements on light rail trains and buses. In Eugene - Springfield, the goal is to connect residents with fulfilling adventures close to home while also marketing to visitors already here. The campaign can be easily expanded to include additional community-adventure pairs. In both the Portland and Eugene - Springfield markets, transit, cable television, Pandora radio and online/social media advertising create a broad reach and reinforce how strongly our communities are associated with unique and memorable adventure experiences. 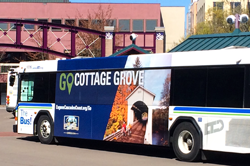 Full color ad wraps are used on buses and trains in the Portland metro area and on LTD buses in the Eugene - Springfield area. Digital ads are featured on Pandora, Facebook, Instagram and YouTube. Audio is playing on Pandora and videos are playing on television and YouTube. The Eugene, Cascades & Coast GO Campaign further develops the Eugene, Cascades & Coast brand platform, by linking specific destinations to key activities. Once on the easy-to-navigate consumer landing page, prospective adventurers are provided broad community information as well as deeper adventure content. We hope this campaign motivates the visitor to GO - have a fun and fulfilling experience in our vast playground!